After my rant from last week, let’s calm ourselves down with an easy peasy blog post about yet another Deer&Doe project! 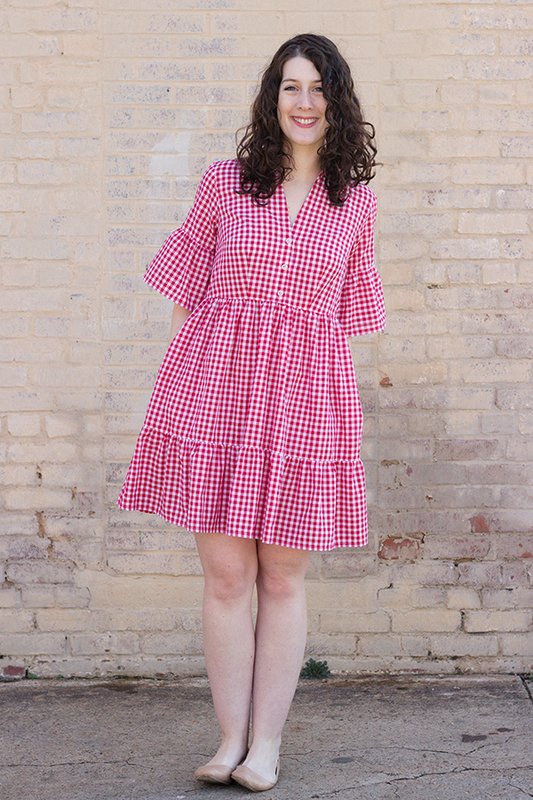 I sewed this dress last May, just before moving to the South. That means I only wore it once, because North Carolina in May is already way too hot and humid to stand that much polyester. 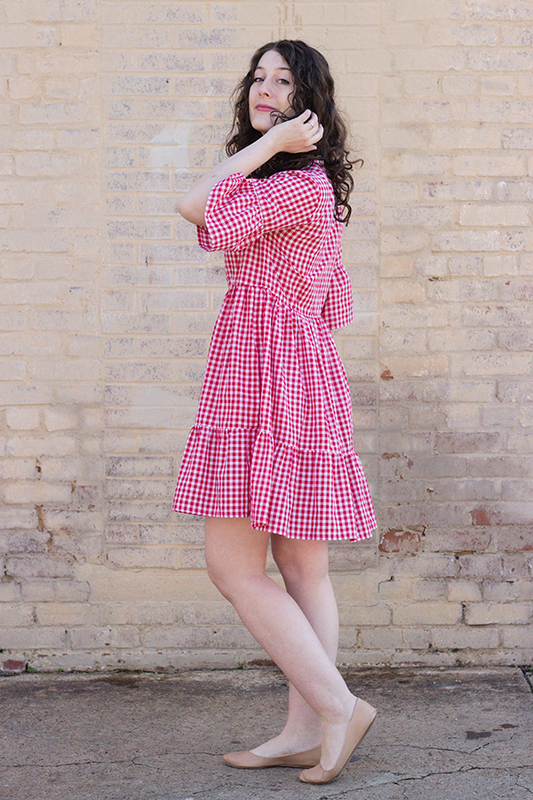 I didn’t wear it in the fall either, since gingham is for me the quintessential spring pattern, so that just felt wrong. But now that this dress is out of the closet, I intend to wear it to death as soon as the weather will permit. Which should’t take long, actually, since today it was 25°C in Raleigh… No sign of the polar vortex over here, I can’t even tell you how happy I am we left Massachussets! 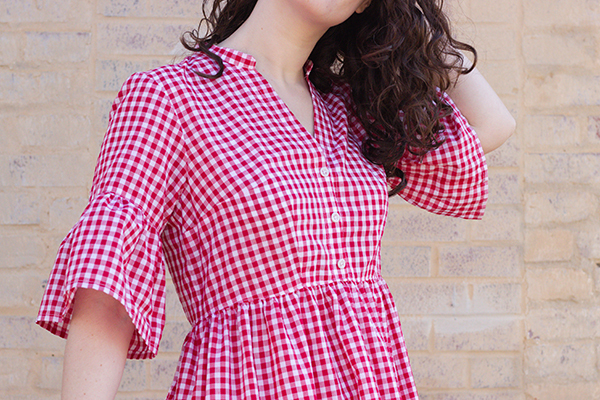 The fabric is the same one I used for my cropped Bruyère shirt, the one posted on the Deer&Doe blog. 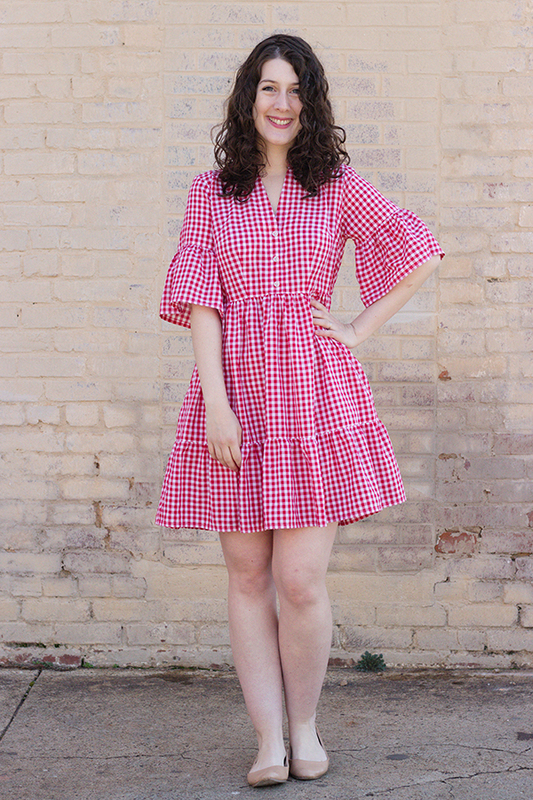 It’s a 100% polyester small-scale gingham, which I had found for next to nothing at Hancock Fabrics right before they closed. The issue with polyester, as I was mentioning earlier, is that it’s not breathable at all. Its advantage though is that it is very lightweight. 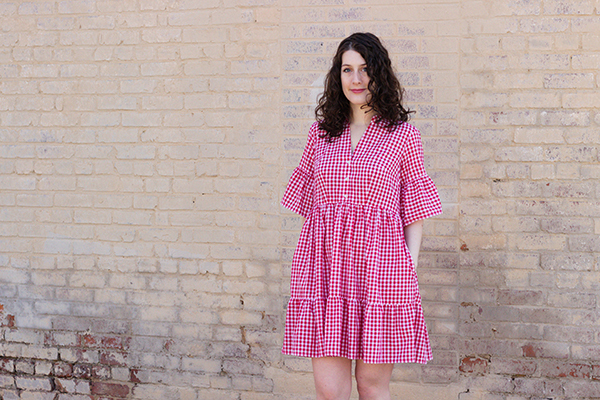 For Myosotis, it’s perfect: the ruffles have some volume but not “in your face” kind of volume, and the floaty quality helps with not feeling drowned in an ocean of fabric. 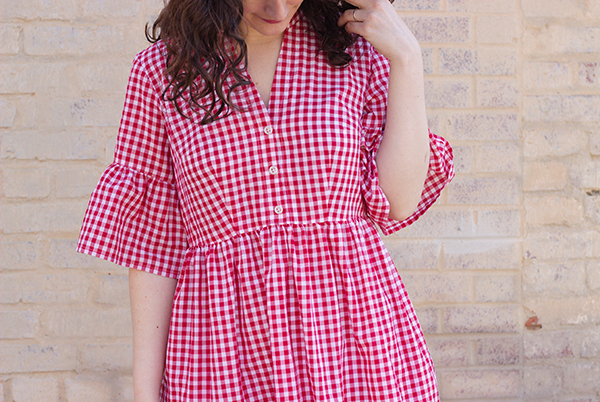 I love the look of these airy ruffles, both the sleeve and skirt ruffles, which bring an additional feminine touch compared to the more plain version of this dress I’m used to wearing. 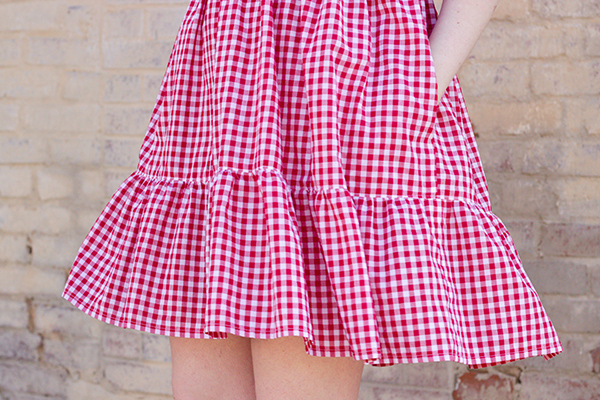 I find the contrast between the loose silhouette and the delicate ruffles very interesting, plus I really like how the gathers look on the gingham, as they create the illusion of a white trim at the seam. The buttons I used are vintage mother-of-peal buttons, which were part of a button card that was either from my mom’s stash or from a flea market I went to. I have so many like this, most of them incomplete with only three or four buttons left over, and I never know what to do with them since that’s not enough for a button-down. With its three buttons, Myosotis is perfect to use all these treasures! From a technical standpoint I think that’s all I have to say about this dress (see the post on my previous version for more info), the main takeaway being that I feel really comfortable and pretty in it, and I think it shows on the pictures! 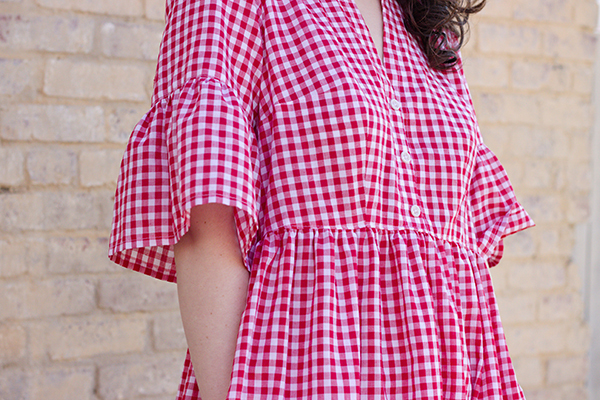 I was convinced that ruffles weren’t my thing, as they’ve always felt a little too “little house on the prairie” for me, but I’m starting to change my mind. I think it’s all about placement and proportions. Ruffles across the bust, like on the Suzon shirt or Magellan blouse? I’ll pass, thanks. But the ones on the Giselle dress are really calling to me. How about you, ruffles or no ruffles?